Never tried adzuki beans? 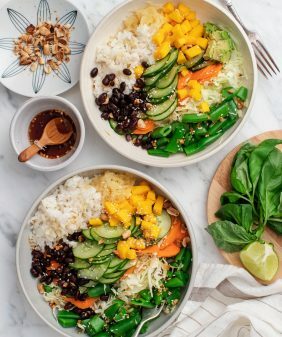 This yummy bowl is the perfect way to try them. And don't worry, if you can't find adzuki beans, black beans sub in well here. Hi, my name is Jeanine, and I’ve been an Instagram addict from the beginning. I love seeing what’s going in on other people’s lives, what they’re making, and most of all drooling over delicious looking food that I want to eat right through the screen. 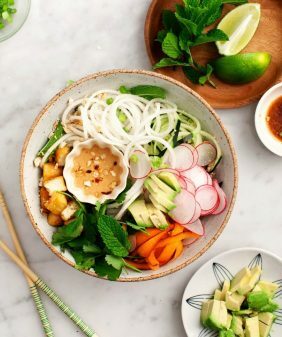 Someone who I’ve loved following is Lindsay Maitland Hunt while she was working on her cookbook Healthyish. It felt like I would always see her photos right before lunch or a few hours before dinner, and I’d just salivate. Her food looks not only so delicious, but it’s the kind of approachable, real life, I-can-make-that-too, kind of food that I always want to have right in front of me at any time of day. So, needless to say, I’m so excited to talk about (and cook from) her book! If you’re not familiar with Lindsay’s work, she was an editor and recipe developer at Real Simple Magazine and Buzzfeed. She’s created recipes for everyone from college students to busy families to seasoned home cooks. The recipes are a mix of really-healthy and mostly-healthy recipes, hence the name. The book is not entirely vegetarian but there are SO MANY vegetarian recipes, especially in the section that’s titled Vegetarian Dinners. I have my eye on the Linguine with Trumpet Mushroom “Scallops” and the Smoky Cauliflower and Onion Frittata. 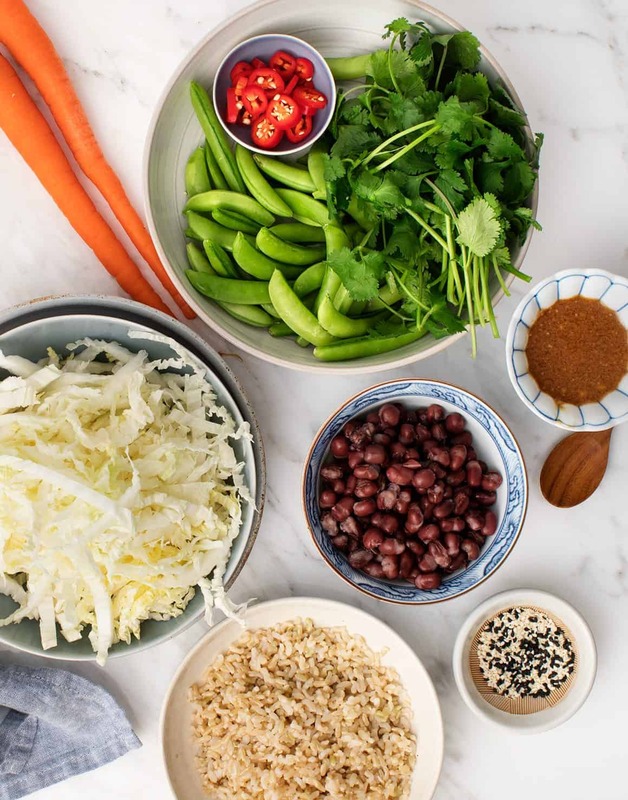 We made these Adzuki Bean Bowls the other night (very healthy without the “ish”), and they are simply delicious. The napa cabbage, snap pea, and carrot slaw takes no time to toss together. It goes over adzuki beans (if you can’t find canned adzuki beans, black beans sub great here) and brown rice. A yummy sesame miso dressing gets drizzled over the whole thing. It’s hearty yet light, crunchy, and so so delicious. I just love bowls like this! You can buy the Healthyish Cookbook here, I hope you love it as much as I do! OR you can win a copy of both Healthyish + (our book) The Love and Lemons Cookbook: head over to THIS Instagram post to enter the giveaway. This recipe comes from Healthyish by Lindsay Maitland Hunt and is reprinted with permission from the publisher. Bring a large pot of water to a boil. 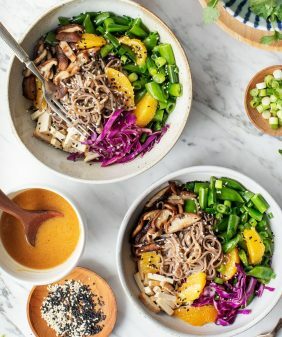 While it comes to a boil, mix the cabbage, carrots, snap peas, and sesame seeds in a large bowl with ¼ cup of the dressing. Use your hands to make sure everything gets evenly coated, or use a spatula. Set aside and toss occasionally. Once the water is boiling, add the rice and 1 tablespoon salt. Reduce to a simmer and cook until the rice is just tender, 22 to 26 minutes. Drain. Just before serving, fold the cilantro in the cabbage salad. 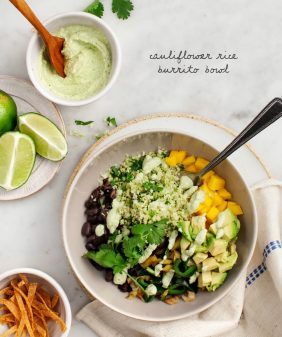 Divid the rice, cabbage salad, beans, and avocados among four bowls. Drizzle with the remaining ¼ cup dressing, and sprinkle with the chile and more cilantro and sesame seeds, if you like. 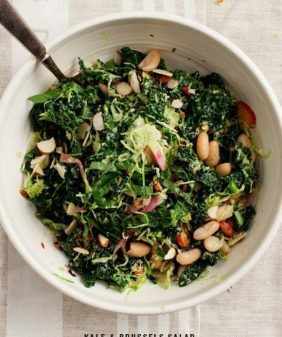 Use any remaining dressing for a salad for another day, it's delicious! This can’t really have a tablespoon of salt added to the rice can it? Seems like a lot. The rice is boiled like pasta in pasta water, so you’re not consuming that much salt – just a different method of cooking rice. Hope that clarifies things! Well, your food is the kind of approachable, real life, I-can-make-that food as well. So I can see why you’re drawn to Lindsay’s style. 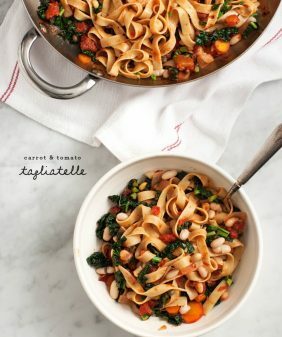 I love the idea to cook rice like pasta – takes all the guess work out of it. 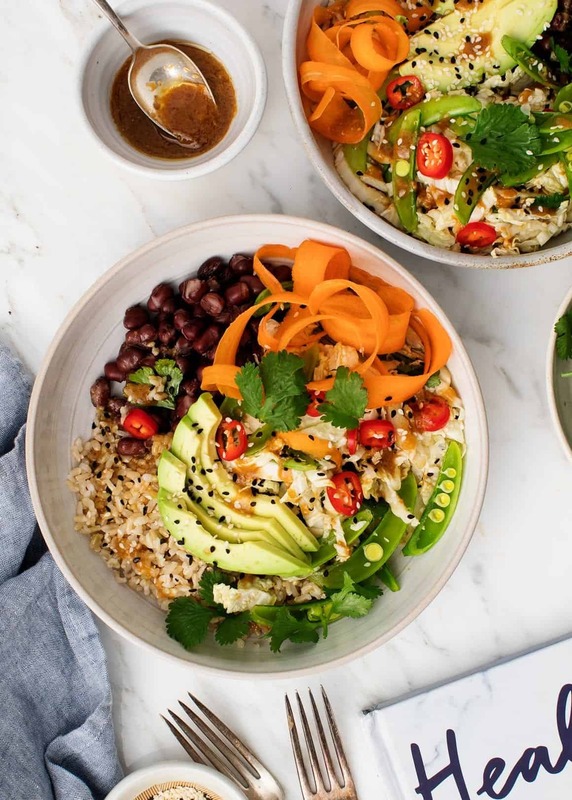 And that miso dressing combined with the crunchy veggies and adzuki beans sound wonderful! This sounds like an awesome winter bowl. A little fresh and crunchy but still using lots of winter veg! The book looks great, too, I’ve been hearing so much about it. YESSS! Such a jam-packed bowl!! Hi! This sounds so good and fresh. Do you not cook the cabbage and sugar snap peas? Is it because they ‘pickle’ in the dressing? If so, could you add bok choy in the same way or would you recommend a quick cook on that first? It’s not cooked, they’re just fresh, crisp and raw and they soak up the dressing nicely. I’ve made raw bok choy salads before – slice the stem part pretty thin and let it sit in the dressing for a few extra minutes. I hope that helps! if you preferred to lightly steam or saute the bok choy, that would be delicious as well – the recipe is flexible enough, either way would be fine. Any recipe that calls for sugar snap peas is usually a win for me. I just love those things. And it’s even got advocado to boot! Delicious recipe! Love the red Beans and Soy sauce. Thanks for sharing! DELISH! My boyfriend, who claims to not like beans or cabbage, raves about this and said he could eat it every night. Our toddler even took a few bites out of my bowl! Can all of this (except the avocado) be prepared the night before? Hi Jessica – it can – the cabbage part will get a little watery (and will look less pretty), but I ate this on the second day and still thought it was super delicious. If you wanted to prep it for multiple days to come, I would just store the dressing separately from the vegetables.